The Parrish House is known around the country as a premier gallery specializing in Parrish art. 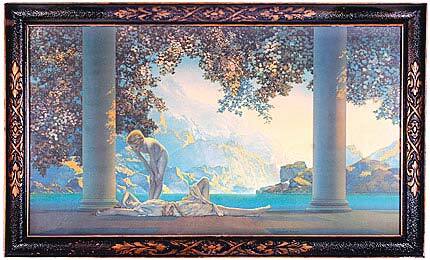 Maxfield Parrish (1870 - 1966) was an American painter and illustrator. 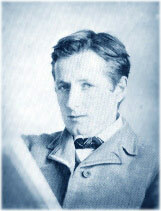 Born Frederick Maxfield Parrish in Philadelphia, Pennsylvania, he began drawing for his own amusement early in his life. He went on to pursue a career that was to last for many decades and effectively shape the Golden Age of Illustration, and the future of American visual art in general. Launched by a commission to illustrate Kenneth Grahame’s The Walls Were as of Jasper in 1897, his repertoire was to include many prestigious projects such as Eugene Field’s Poems of Childhood (1904) and the traditional Arabian Nights (1909). 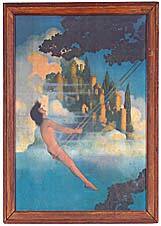 Androgynous nudes in fantastical settings were an often-recurring theme. He continued in this venue for the rest of his life, living comfortably off the royalties brought in by the production of posters and calendars featuring his works. Parrish was famous for the dazzlingly luminous colors that marked much of his artwork; the shade “Parrish blue” was coined in acknowledgement. He achieved this result by means of a special technique involving several coats of oil and varnish applied to his paintings. It is impossible to categorize Parrish’s work, since he was part of no traditional movement or school, and developed a truly original style. Parrish continued painting until he was about 90 years old and died at age 96. Each new generation seems to rediscover the magic and romance of Parrish art and some of his prints now command prices that reach into many thousands of dollars. Fortunately, many images may still be obtained at modest cost.